Higurashi no Naku Koro ni is an interesting show to say the least. What begins as a seemingly moe school life series is quickly marred by the effects of distrust, violence, and murder. It is a great show for fans of the mystery, horror, and supernatural genres, but there are a few places in which it falls short of expectations. High school student Maebara Keiichi is new in the small rural town of Hinamizawa. He has quickly made friends with the small group of students in the town's single school, and he hangs out with a "club" of 4 girls who play games and hang out all day. The club is made up of upperclassman Mion Sonozaki, Rena Ryugu, from Keiichi's grade, Rika Furude and Satoko Hojo, both in a lower grade. However, things start to go wrong as Keiichi realizes that these girls are not all that they seem, and the simple town of Hinamizawa may hold a terrible age-old secret. The story is ordered strangely, as it is comprised of six separate arcs that show the same (or similar) events, albeit played out in different situations. For example, a murder will take place due to a certain event in one arc, but in the next, that same murder will occur for a totally different reason. In addition, there are various role reversals, many of which completely switch whole character personalities. By the end of the anime, the various arcs end up answering many of each otherâs questions and mysteries, although some information is left for the viewer to decide on. 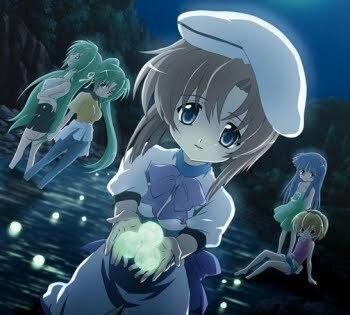 While Higurashi has an incredibly unique and fast-paced plot, that is not enough to keep viewers interested on its own. Each arc connects with the other ones, creating a much fuller story by the end than there seems to be at the start. In addition, the mysteries and downright creepy moments contained in each arc make for stories that are both intelligent and wonderfully addicting. There are at least three points late in Higurashi when I let out an audible gasp as I realized a connection between two previously confusing events during the story. This ability to keep the viewer on their toes, constantly making connections, is one of the things that make Higurashi such a brilliantly crafted story. Of course, the series also manages to keep horror fans interested, as it contains lots of bloody violence, mysterious murders, insane teenagers, and maniacal laughing. Even so, the plot is marred by those ever-present horrors--plot holes. Most prominent are the leaps of faith made by the writers, as they turn seemingly normal characters into insane psychopaths over simple issues. Now that means either everyone in Hinamizawa is just crazy anyway, or these kids are really over-sensitive. Itâs important to note that while many events are repeated, and there are a few characters that die the same way every time, the plot never gets repetitive. Since the events are implemented in different ways, they still feel fresh, regardless of the number of times they are reused. Higurashi's odd character design style is known as moe, and looks as it does primarily because the series was adapted from a doujinshi (fan-made) game. The girls all have huge heads, tiny necks, massive eyes, and strange hair colors, so if you don't want to watch crazy bobbleheads kill each other, Higurashi might not be for you. Even male characters like Keiichi are exaggerated, though one character in particular, the detective Oishii, looks fairly close to normal. This has been cited as a flaw by many, but I feel that the use of moe characters, whether intentional or not, adds an element of incongruence to the series, enforcing the feeling that everything in Hinamizawa is a little off-kilter. It's quite a minor thing, but I noticed that throughout the series, each character is constantly seen with the exact same clothes all the time. (they're clearly not school uniforms, though) As the series goes on, this oversight in character designs might become a little irritating for nitpicky anime fans. Finally, the character designers did get one thing resoundingly right. When those cute little faces go insane, Higurashi gets absolutely freaky. The characters' faces contort in ways no human face should ever be allowed to move, while their pupils turn to slits and their mouths fall into maniacal smiles. Plus, almost every major character gets their well-deserved chance to go crazy and show off their evil smile! The opener, with the quite originally titled "Higurashi no Naku Koro ni," is a fairly good song, with its distorted guitars and odd vocals creating the same sense of freakiness that the rest of Higurashi gives off. However, "Why, Or Why Not," the series' ending song, is boring, and its badly sung Engrish makes for some painful listening for anyone with a faint knowledge of the English language. During the anime itself, the only music that can be heard is mediocre (but not altogether ineffective) atmospheric music that adds a bit to the creepy scenes, but does not contribute considerably to the series. In conclusion, Higurashi no Naku Koro ni is a show that succeeds on many levels, but one whose failures are also irritatingly prominent. As a horror story, Higurashi will definitely be able to keep its viewers interested with its intense levels of suspense. And with a wonderfully unique fractured storytelling style, the series also provides viewers with a new way to watch anime. However, this is all at the expense of important details such as character motivations and realism. When They Cry ~ Higurashi is not an anime to be overlooked. If you search below its cute, funny exterior, you will find a disturbing, insane, and yet strikingly original vision of a village consumed by fear, hatred, and paranoia.